From DragTimes.com . It says its stock. Looks like the car is from New York. A 1.815 60 foot is pretty good. 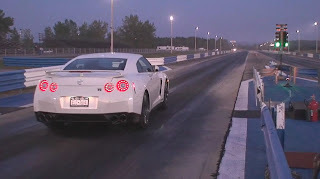 121 mph is on the high side of what we are seeing for stock R35 GT-R's. So far haven't seen a 10 second time slip yet. Seen a few 11.1's. Time slip..